June 4, 2013  New data about the tornado, which has been blamed for 18 deaths, was released Tuesday. 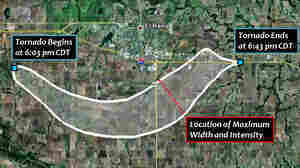 Its intensity was upgraded to the maximum of EF5, and the weather agency says its winds reached 295 miles an hour. 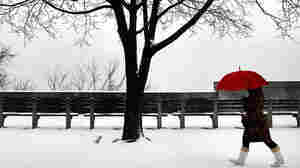 February 9, 2013  The hype surrounding major storms follows a predictable pattern — plenty of buildup and panic before it peaks, plateaus and peters out. Could this kind of hype cycle have consequences for storm victims? 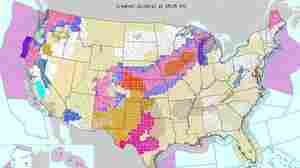 December 19, 2012  The powerful winter storm has prompted avalanche warnings in Utah, and blizzard watches in the Plains states. Travelers are advised to watch for airline delays. 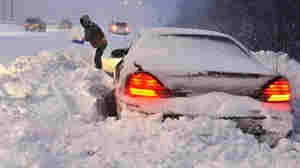 October 18, 2012  The National Weather Service's Climate Prediction Center has released its winter outlook. It says chances are good that some parts of the nation hit hard this year by dry and drought-like conditions won't be getting a "normal" amount of precipitation. June 30, 2012  High temperatures cooked up storms that lashed the Eastern U.S. overnight, and more than 2 million homes lost power. Friday, heat hit record highs around the country. 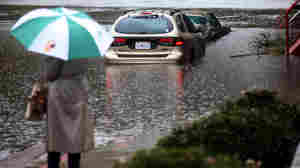 June 30, 2012  Friday's record-setting heat and brutal storms left much of the Midwest and Eastern U.S. cleaning up damage and waiting for crews to restore power on Saturday. More heat and more storms are on the way, too. 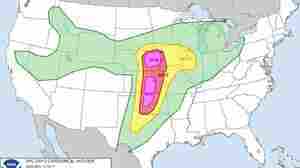 April 13, 2012  Dangerous storms are expected from north central Texas up through Oklahoma, Kansas, Nebraska, Missouri and Iowa and as far east as Wisconsin. 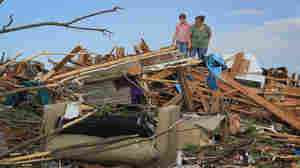 May 24, 2011  Already struggling to recover from Sunday's devastating tornado that killed more than 100 people, residents of Joplin, Mo., have more severe weather to worry about later today. April 28, 2011  The National Weather Service's Storm Reports page tells a lot about how far-reaching the severe weather, which left at least 200 people dead, was on Wednesday. Powerful New Storms Trigger Damage, Help Set Possible Tornado Record? April 27, 2011  The National Weather Service has issued a rare storm warning, saying the Midwest and South are at risk of deadly tornadoes today. 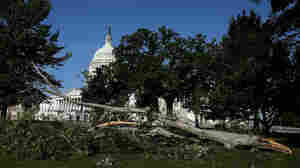 April, 2011 could set a record for tornado activity.